SWIRL RIB -or-TWISTED OPTIC - Mayo - Marigold. SWIRL RIB Compote (OR) TWISTED OPTIC Mayo.?? : Mitchell Stewart sent this photo and measurements of the piece in his collection, on Aug. 20, 2013. He states that the iridescence is of the type seen on Depression glassware. 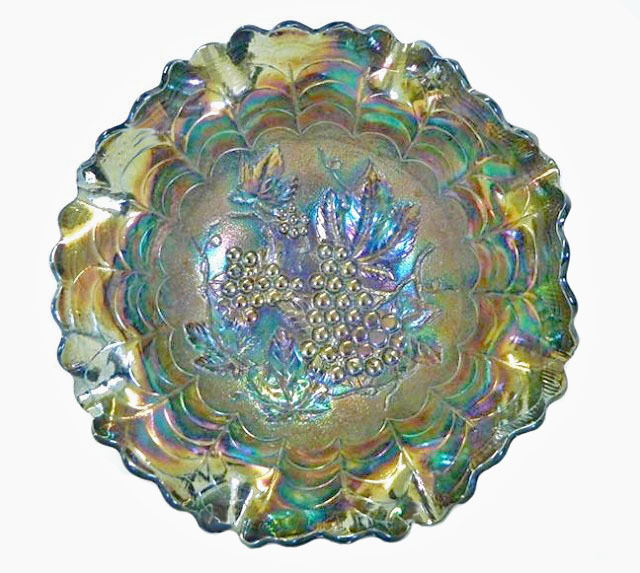 Since both writers of Carnival Glass, as well as Depression Glass declare a sherbet and no mayonnaise compote of this size, we are left to presume that only this larger size was made during the Depression era…….1927-1930? It is 6 ½” wide x 3 ½” high x 3 ¼” diameter foot. 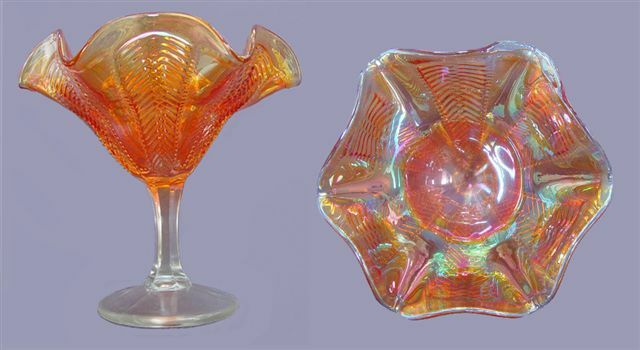 Clearly it is too large to be considered a sherbet, as listed in both the 1979 issue of the Gene Florence Depression Glass Book and Carl Burns’ 1996 Imperial Carnival Glass Book. Please note: No size for the sherbet is listed in either book! 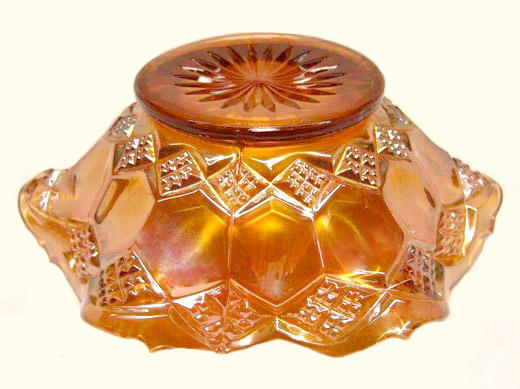 Pink, Green and Amber are the listed colors produced in Depression Glass. 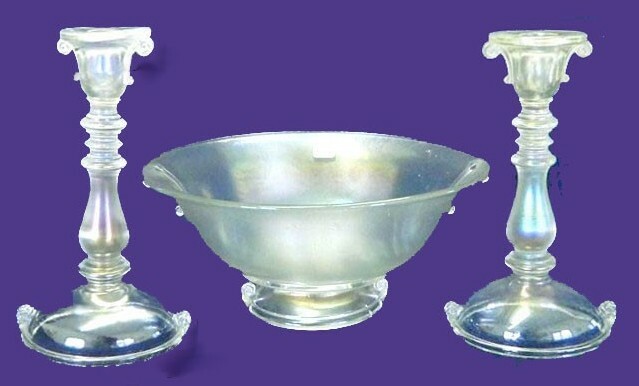 Since Mitchell provided the “compote”, an under plate having the same design characteristics has presented itself. This leads to the distinct possibility that the two components provide evidence of a couple of items within the SWIRL RIB pattern which were not known to exist at the time of earlier written accounts. Swirl Rib Cup and Saucer - Marigold. 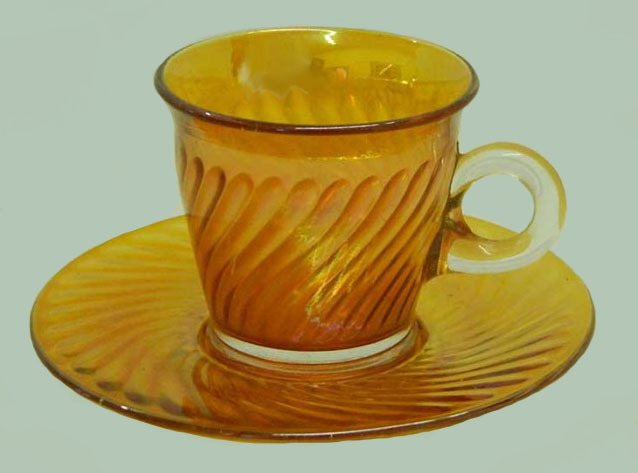 SWIRL RIB Cup & Saucer: Scarcely ever included in a carnival glass auction of collectors’ glass, examples within this pattern are likely considered by most collectors to be from the Depression Era. Marigold is the only known color. 1909 Catalog ad for Herringbone and Beaded Ovals. Herringbone and Beaded Ovals compote - Marigold. During the 1960s and 1970s, the design was reproduced in a variety of shapes and colors, trademarked with IG or LIG logos. Items from that era include bowls, covered candy dishes, compotes and handled baskets in marigold, emerald, pink, red, and smoke. BLAZE 4.25 in Sauce ln Blue - Seeck Auctions. 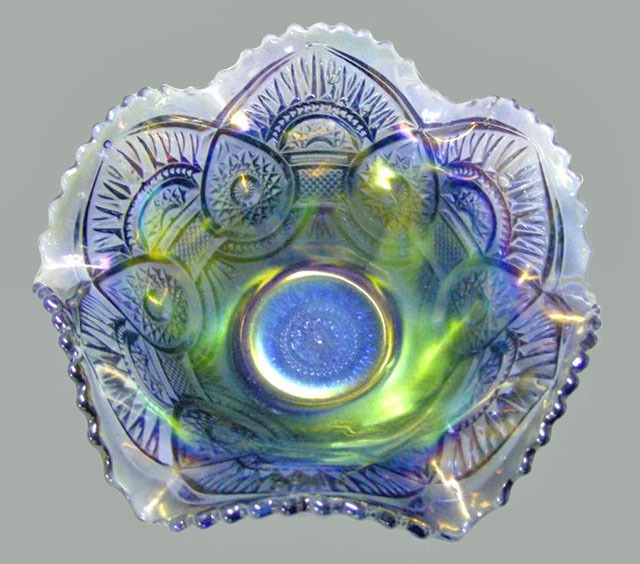 BLAZE Small Berry Bowl: This berry set pattern dates to the January 1909 Imperial General Catalog. 9”-10” bowls are known in clambroth, green, marigold, purple and smoke. The 5” sauces are known in those same colors, as well as green. A 4 ¼” sauce sold in 2013 for $700. Blue TWINS 6.25 inch sauce - RARE! TWINS Small Berry Bowl: 9”-10” berry bowls are known in marigold, helios and smoke. This is another Imperial pattern dating to 1909. A small berry size in blue sold in 1996 for $350. “Possibly” the same example sold in 2013 for $485. Fruit bowl/base are known in marigold and smoke. 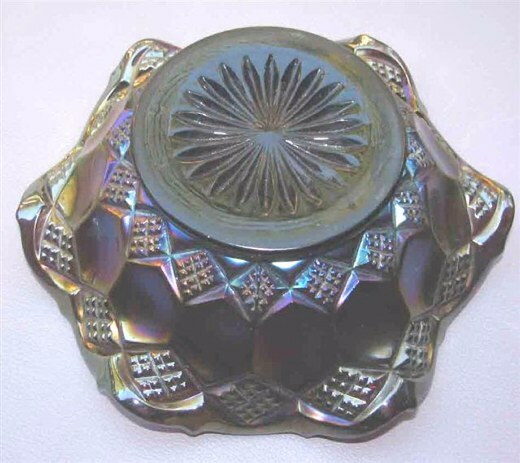 As with some other early bowls, this pattern was used to enhance/sell metal holders in the early 1900s. Blue IMPERIAL GRAPE 8-9 inch ruffled, collar base bowl. 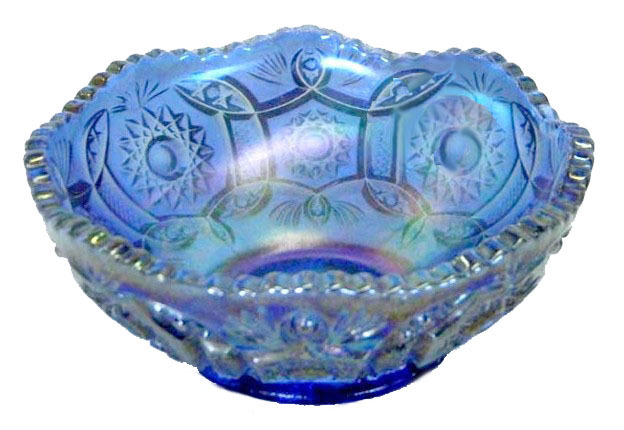 IMPERIAL GRAPE Bowl-BLUE: Marigold and helios are the usual colors found. Purple is a bit more challenging! Scarce in clambroth, amber and lavender; quite rare in emerald and smoke. Only one rare cobalt blue example is known! At least 25 different shapes are known in a wide range of colors within this popular pattern. When Harry Northwood introduced the popular Grape and Cable line in 1910, Imperial Glass followed with their own famous grape design. THREE and ONE - 6.5 in. sauce in Amber! PURPLE THREE and ONE 6 inch Sauce. THREE and ONE - 7 inch Plate in Smoke. Courtesy Carl & Eunice Booker. In late March 2014, Mike Carwile discovered an amber bowl in this pattern. Since none of the previously written accounts of this pattern mention that color, it is quite possible that it was a 1970s era production when paper labels were applied. Since the majority of those would have “fallen away” by this time, this would account for its lack of notice during the vintage era. 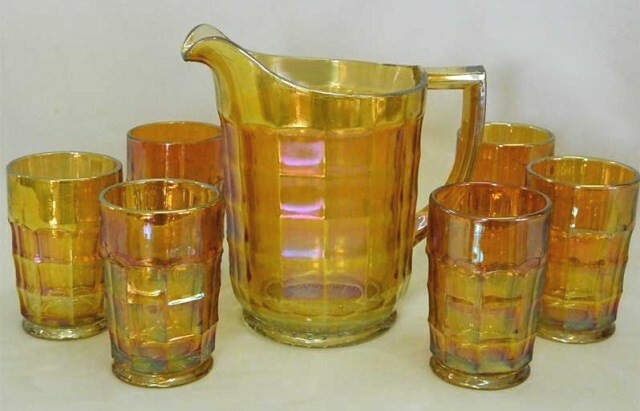 Ranger Water Set in Marigold. RANGER Water Set: Listed in old Imperial Factory catalogs as their #711 pattern, and known to have exported glass to Europe, Central America, and Australia, it is interesting to note that versions of the Ranger pattern were produced by Crystal Glass Co. of Sydney, Australia; Christales de Mexico of Mexico; the Josef Inwald Co. of Prague, Czechoslovakia, and at least one English firm. 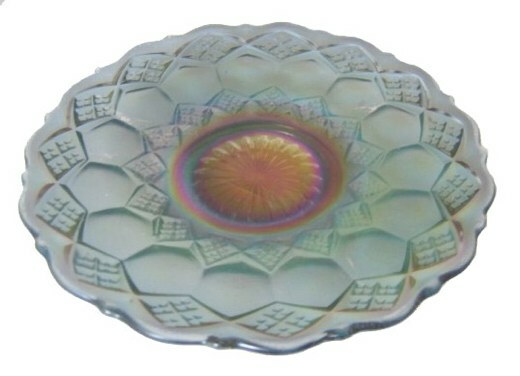 Carl Burns did extensive research on this pattern and feels that the pattern originated with Imperial Glass Co. Foreign production began in the mid 1920s, extending through the early 1930s. This rather confirms the fact that the design originated with earlier shipments of glass from Imperial Glass Co. into those countries. Imperial produced water pitcher, tumbler, creamer, sugar, sherbet, bowls in 8”-10” sizes in marigold, along with an 8” pedestal-footed vase in marigold, smoke and clambroth. Double Scroll Console set in White. DOUBLE SCROLL Console Set: When buyers’ tastes began to change in the 1915 -1920 period, this pattern was one which “bridged the style changes” in glassware finishes. This set can be found with either carnival glass or stretch glass finish. The three piece set, comprised of a pair of 7”-8” candlesticks and matching console bowl which is dome footed, oval in shape, being about 12” in diameter from end to end. Marigold, clambroth, smoke, teal, red, and amberina and white are basic colors. Helios has been discussed, but not confirmed. I have become sounding brass or a clanging cymbal. So that I could remove mountains, but have not love, I am nothing. and though I give my body to be burned, but have not love, it profits me nothing. whether there is knowledge, it will vanish away. For we know in part and we prophecy in part. then that which is in part will be done away. but when I became a man, I put away childish things. For now we see in a mirror, dimly, but then face to face. Now I know in part, but then I shall know just as I also am known. And now abide faith, hope, love, these three; but the greatest of these is love. Great Reference for Newer Carnival Glass.